On the night of Vince Foster's death, July 20, 1993, the Park Police went to the Foster home to notify the family and interview them as part of their investigation. The police arrived at the home at the same time as Foster's sister Sheila Anthony. Walter Pincus, a Washington Post reporter, was at the small Georgetown townhouse when the police investigators interviewed the family for over an hour and were told Foster was not depressed. Eventually the press began to report Foster was suffering from depression. The Washington Post reported that Foster's “weight plummeted.” On August 9, 1993, The New Yorker published an article by Sidney Blumenthal—soon to become a Clinton confidant—that said Foster had lost 15 pounds due to depression. Gradually family members changed their stories from what they first told the Park Police. The evidence does not support the claims by Blumenthal that Foster lost 15 pounds and Sheila's account that he “weighed much less”. Foster had a physical on December 31, 1992, before coming to Washington and he weighed 194 pounds. At the autopsy, July 21, 1993, his body weighed 197, a net gain of 3 pounds. Sheila's FBI report further states that her brother called her on July 16, to tell her he was “battling depression.” Foster's widow, Lisa told the FBI “he mentioned his depression to her on approximately July 16.” If these FBI reports are true, why did the family deny Foster was depressed when police asked them on the night of Foster's death? 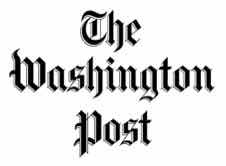 The Washington Post has played an active role with the FBI in covering up the truth about the death of Vince Foster. 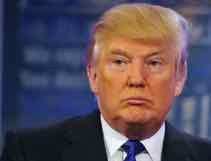 On May 23, 2016, The Washington Post continued the cover-up by publishing an interview in which presidential candidate Donald Trump called Foster's death “fishy” and then on May 26 publishing a column by Foster's sister Sheila scolding Trump and repeating the story that Foster was depressed. 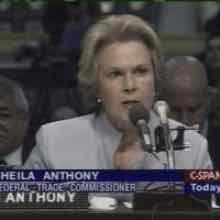 "[Donald] Trump cynically, crassly and recklessly insinuated that my brother, Vincent W. Foster Jr., may have been murdered...” wrote Vince Foster's sister Sheila Foster Anthony, “Vince called me at my office in the Justice Department a few days before he died. He told me he was battling depression and knew he needed help...I told him I would try to find a psychiatrist who could help him and protect his privacy. After a few phone calls, I gave him three names. That list was found in his wallet with his body at Fort Marcy Park in McLean. I did not see a suicide coming, yet when I was told that Vince was dead I knew that he had killed himself. Never for a minute have I doubted that was what happened." Later that same day The Washington Post then reported that Trump said Vince Foster should not be part of the presidential campaign. There are multiple stories about a list of psychiatrists, some reports have said the list was found in Foster's office and others said it was found in his car. The Park Police did not include a list of psychiatrists in their initial list of evidence recovered at the scene. Later investigator Rolla said he found the list in Foster's wallet in his car. Investigator Cheryl Braun reported she found Foster's wallet in his car. White House spokesperson Dee Dee Meyers and others said it was a list of two psychiatrists. Others say it was a list of three. Stories about this list of psychiatrists first appeared a week after Foster's death. 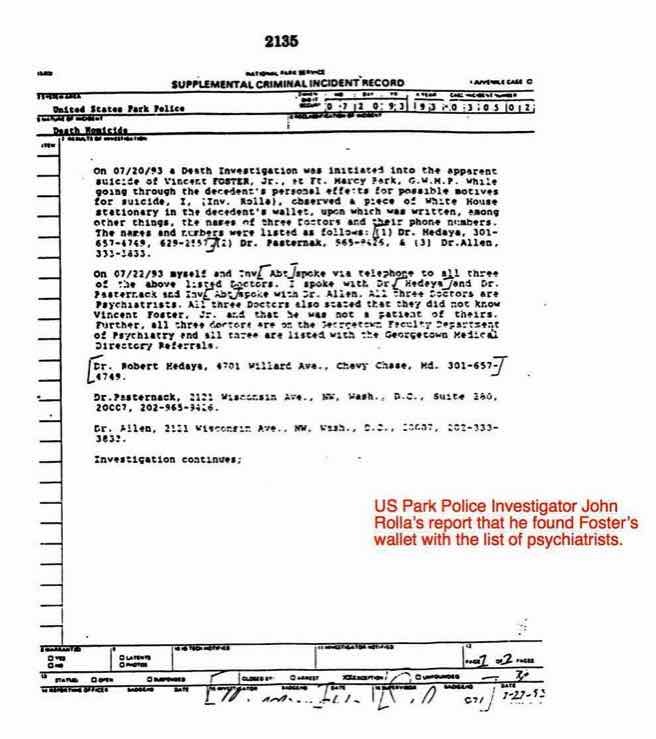 In her FBI interview report Sheila said she called one of the psychiatrists and spoke to him about her brother. 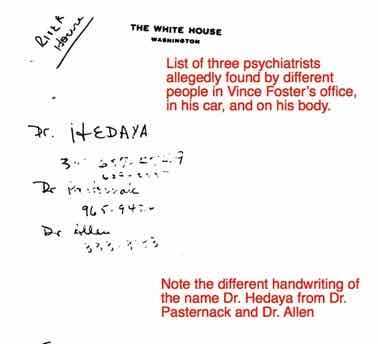 Rolla reported he contacted these psychiatrists and none of them knew Foster. None of these psychiatrists mentioned any call from Foster's sister. The most disturbing thing about the changing story by Foster's sister is that she ignores the overwhelming evidence of a cover-up of her brother's murder. Even if Foster's sister believes her brother was depressed she ought to be curious about how he arrived at Fort Marcy Park without his car and all the other evidence of a cover-up. 1. There was a bullet hole in Vince Foster's neck. 2. Photographs of the bullet hole vanished. 3. X-Rays of the bullet hole vanished. 5. Mr. Foster's car was not in the park. The footnotes left out were significant. For example, on page 21, Starr wrote that the witness Patrick Knowlton saw a “rust brown car with Arkansas license plates.” In a footnote they say that Foster's car was a “gray Honda Accord with Arkansas plates” and Starr made nothing of the color discrepancy on the same page. The Post dealt with this discrepancy by leaving out the footnotes. Associate independent counsel Miguel Rodriguez, the lead investigator, resigned from Starr's staff and wrote in his resignation letter that Park Police and FBI reports of the investigation on Foster's death did not accurately reflect witness statements. An internal memo by Rodriguez found at the National Archives stated that a gun was planted by police in Foster's hand before the crime scene was re-photographed. Audio recordings of Rodriguez reveal how the cover-up of Foster's murder was orchestrated inside the Office of Independent Counsel and the press controlled how it would be reported. What are her thoughts about the court ordered appendix to The Report on the Death of Vincent W. Foster, Jr., by the Office of Independent Counsel In re: Madison Guaranty Savings & Loan Association? Is she not troubled by the clear indications of a cover-up in the case of her brother's death? Why would she join forces with an organization like The Washington Post, which has been a major participant in the cover-up from the beginning? Vince Foster's sister Sheila was questioned by the Park Police on the night of her brother's death. Park Police officers Cheryl Braun and John Rolla testified the Foster family denied the were signs of depression. 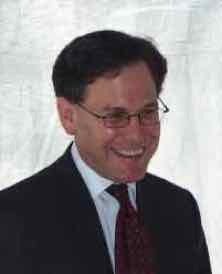 Advisor to Hillary Clinton, Sydney Blumenthal publicized the false stories that Vince Foster had lost 15 pounds and drove his car to Fort Marcy Park. 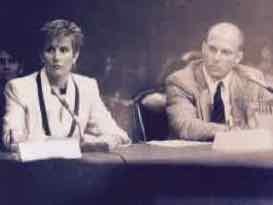 After The Washington Post published a rebuke of Donald Trump by Foster's sister Sheila the Post reported Trump did not think Vince Foster "should be part of the campaign." 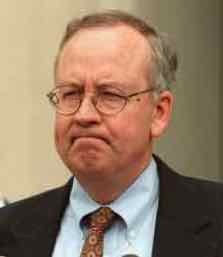 Kenneth Starr was ordered by the US Court of Appeals to include evidence of the cover-up in his report on the death of Vince Foster. 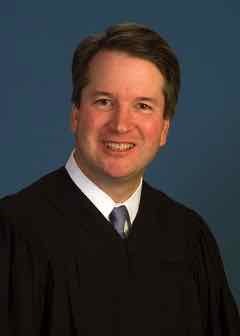 Presdent Donald Trump nominated Brett Kavanaugh, the head of the cover-up of the murder of Vince Foster, to be a Supreme Court Justice. The Washington Post has been a major participant in the cover-up from the beginning.